Learn all about fire pit safety. Winter is officially here along with frigid temperatures, but cold weather shouldn’t stop you from enjoying your backyard features. One of the best ways to extend the life of your landscape throughout the year is investing in a fire pit. When you are using your fire pit, it is critical that you are your family are safe at all times. Luckily, there a few simple ways to stay safe while setting up and operating an outdoor fire pit so that your family can enjoy it all year long. 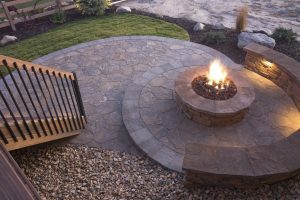 One of the most important aspects regarding fire pit safety is position and location. Whether you have a portable or permanent structure, it needs to be placed on leveled ground to prevent the fire from spreading. It is critical that is placed on a non-flammable surface such as concrete blocks. Make sure your fire pit is at least 10 to 25 feet from any structure especially a deck or low hanging branches. The last thing you want it a fire starting in your backyard and leading to your home. Before you light your fire pit, it is essential that the center should be at least six inches deep and two feet across to contain the flames and embers. You should put dirt or rocks around your fire pit to prevent flames from escaping. When you want to light your fire pit, check the wind and if it is too windy, do not light it. You should use a commercial fire starter stick to light your fire pit instead of flammable fluids. After you light your fire pit, make sure you never leave it unattended and always watch your children and pets while they are around it. Avoid wearing any loose or flammable clothing when you are near your fire pit. No one wants to have their shirt light on fire when they are trying to enjoy their fire pit. Make sure you keep a container of water nearby just in case of an emergency. This entry was posted on Sunday, December 24th, 2017 at 4:54 pm. Both comments and pings are currently closed.